Natural disasters carry enormous costs every year, both in terms of lives and materials. Evacuation from potentially affected areas stands out among the most critical factors that can reduce mortality and vulnerability to crisis. We know surprisingly little about the factors that drive this important and often life-saving behavior, though recent work has suggested that social capital may play a critical and previously underestimated role in disaster preparedness. Moving beyond retrospective self-reporting and vehicle count estimates, we use social media data to examine connections between levels of social capital and evacuation behavior. This work is the first of its kind, examining these phenomena across three major disasters in the United States—Hurricane Harvey, Hurricane Irma, and Hurricane Maria—using aggregated, de-identified data from over 1.5 million Facebook users. Our analysis confirms that, holding confounding factors constant, several aspects of social capital are correlated with whether or not an individual evacuates. Higher levels of bridging and linking social ties correlate strongly with evacuation. 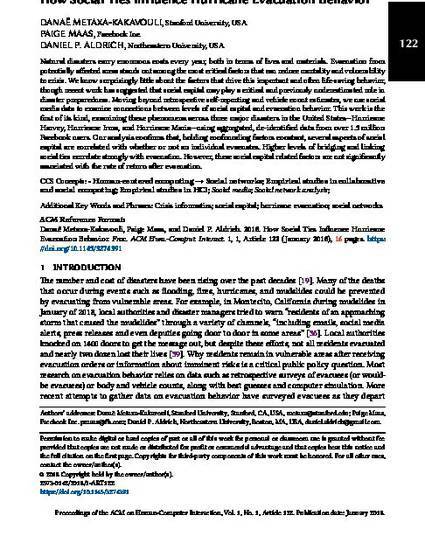 However, these social capital related factors are not significantly associated with the rate of return after evacuation.